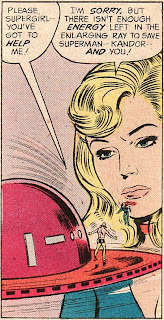 This "Supergirl as Monster" moment, as drawn by Art Saaf, is from the 1972 series Supergirl #8. Not only does she have hair like a real medusa in the issue, but she has the petrifying gaze too! Hope everyone has a happy and fun-filled Halloween! With a new Kandor suddenly re-grown on Earth, I thought it might be interesting to review the Silver Age issue equivalent. 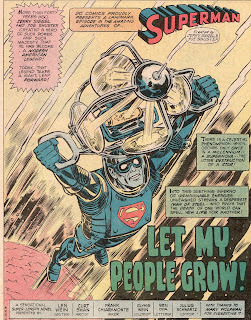 Released in 1979, Superman #338 was titled ‘Let My People Grow’, written by Len Wein and drawn by Superman legend Curt Swan. 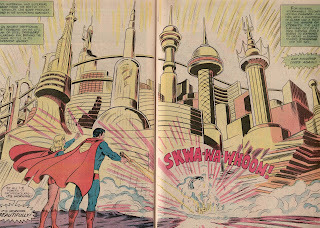 It had a pretty big impact on both the Superman and Supergirl mythos at the time, removing a fairly crucial piece of lore, the bottle city of Kandor. It also, thankfully, removed an easy ‘deus ex machina’ from Superman stories. Much like Kryptonite seemed to be a near ubiquitous substance in this time period of stories, the ‘let’s go to Kandor for a super-science answer to our problems’ was also an over-used plot device. 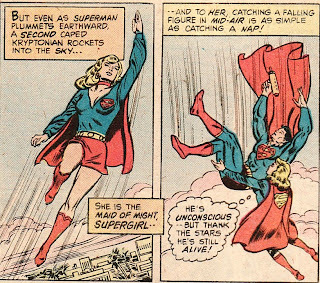 Heck, Supergirl even used a Kandorian super-exo-skeleton for a time in Adventure Comics. This story starts out with Superman in deep space trying to harness the exploding energies from a super-nova at close range. While he is successful, it turns out that even a Silver Age Kryptonian cannot withstand a super-nova explosion to the face. As he enters Earth’s atmosphere, he passes out from radiation exposure and exhaustion. Luckily Supergirl is part of the plan here and was scanning the skies for Superman to return. She flies up and catches him, thus saving the collected energy gun from any damage. 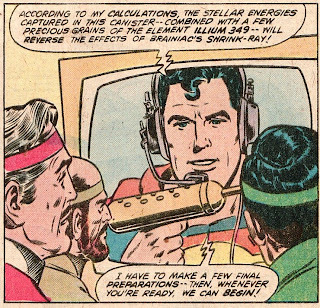 Superman awakens without too much of a solar hangover and gleefully tells the Kandorian Science Council that the stored solar energies combined with precious Illium 349 will reverse Brainiac’s shrink ray. The Kandorians are a bit cautious, not willing to chance it. But Superman assuages them by saying that he will test the ray on a living being first. And rather than risk the life of a single Kandorian citizen, he will test the ray out on himself. While it sounds pretty noble, doesn’t this seem like sort of a bad idea? First Superman has to get shrunk by Brainiac. Then, he has to risk his life with the enlarging ray. Isn’t there any other way? Heck, Van-Zee even volunteers. Regardless, Superman decides to move forward with his plan, which involves luring Brainiac to Earth and goading him into using his shrink ray. 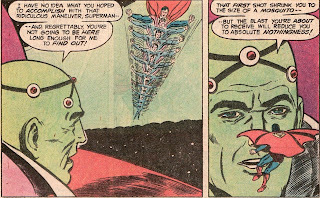 Superman does this by rigging up an electronic beacon tuned to Brainiac’s brain giving Brainiac an incessant migraine. It works too! In fact Brainiac gets so ticked off, he bathes Metropolis in a tractor beam, shaking the city as if a massive earthquake has hit. I again have to note that this was the down side to Superman’s plan. Let’s say Metropolis got leveled here … would Superman be happy with his plan? Somehow ... luckily ... the plan works, Superman tricks Brainiac into shooting him with the ray, shrinking him down to bug-size. At this point, Superman’s ‘emergency weapon’ comes into view. 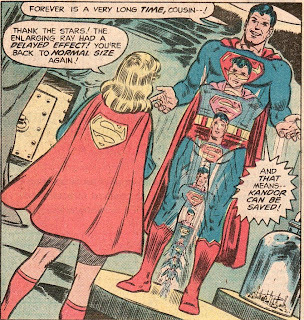 Supergirl has been hiding the entire time, awaiting the moment to use the enlarging ray on a shrunken Kal-El. 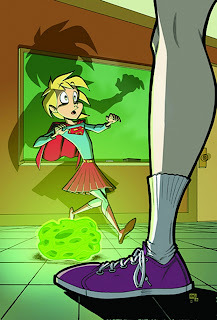 Brainiac in turn decides to try to shrink Kara. She is able to deflect the shrink ray with a blast from the enlarging ray gun. Brainiac, struck by the full force of his own ray, begins to rapidly shrink. Here is my favorite scene from the book. As Brainiac realizes he will shrink down to nothingness, effectively killing himself with his own weapon, he begs Kara to save him. But look at the steely look on Supergirl’s face. 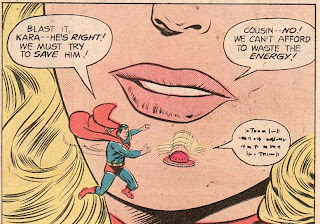 She calmly tells him that there isn’t enough energy for Superman, Kandor, and Brainiac. In essence, he is out of luck. She is as cool as the other side of the pillow here. Even Superman begs her to use the ray to save Brainiac, but she firmly reiterates that she won’t. She almost chastises Superman for thinking it. “Cousin … NO!” That's some intestinal fortitude right there! I don’t know about you, but I think Supergirl made the right decision here. A tough one … but the right one. Heading back to the Fortress, Supergirl finally uses the ray on Superman and he grows to normal size with no apparent side effects. 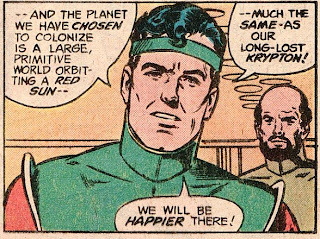 They contact Kandor again with good news and are told that the citizens have chosen a large primitive world orbiting a red sun, much like Krypton. The super-cousins fly a rocket to the planet (remember it is in a red sun galaxy) and then Superman uses the gun with dramatic effect. Sorry about the double page spread, this was the most I could fit on my scanner. Once enlarged, a different sort of Kara reunion with her parents takes place, one less creepy than the more recent one seen in the New Krypton Special. While she would love to stay and live with her parents, she has made a life on Earth and so will stay there. 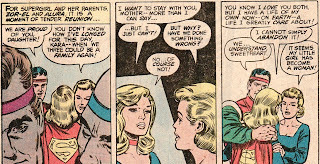 Alura tells Kara that she has grown into a woman. But the good times don’t last too long. For some reason, the structures of Kandor cannot withstand the expansion and suddenly collapse into dust. I hope everyone was out of the buildings and on the ground. Anyone higher than 2 stories is probably hurting right now. Of course Superman feels pretty lousy about what he perceives to be an error on his part. 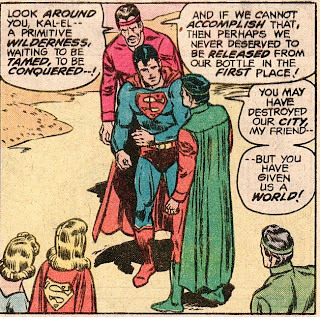 But Van-Zee takes it all in stride telling Kal that while he destroyed their city he gave them a world. Indeed, another scientist tells Superman that if they cannot tame this world they did not deserve to be enlarged at all. I don’t know about this. Can you imagine taking a society based on super-science and putting them into a wilderness where they will need to build even the most rudimentary tools? Sounds like a good setting for anarchy. What about medicine … structures … anything? Don’t you think there is a subset of people now wishing they were on that yellow-sun planet? Superman says he will stay to help, but that idea is emphatically shot down by Van-Zee. Look at the glass jaw on Superman, knocked out with one punch. Turns out the Kandorians have felt a bit like pets for some time and wish to get out from under Superman’s watchful eye. They even chose this planet because it lies on a cosmic axis, thus phasing in and out of this dimension. Man, they really wanted Superman out of their business. But couldn’t they just explain that to him rather than rough him up? Don’t you think Supergirl might have wanted to know this earlier so she could talk to her parents more before being shuffled off the planet? Well, it turns out they did just fine. We saw ‘Rokyn’, planet’s name, a couple of other times as it annually would enter this dimension. Superman even delivered Kara’s body to her parents after her death in Crisis on Infinite Earths. I have to say this is a somewhat important issue for the Silver Age Superman history and is readily available for under $5. For Supergirl fans, the scene with Brainiac alone makes it worth the price, but as this did involve her family, it impacted her greatly as well. It is a worthy part of a Supergirl collection. 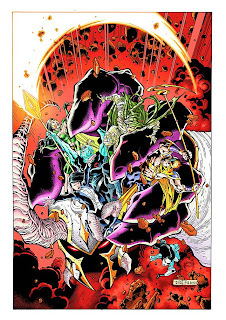 If you can overlook some of the bigger problems with the story (luring Brainiac to attack Earth, shrinking yourself without knowing if you can return, Kandorians picking a wild world to live on, and slugging Superman who has kept them safe all this time), it might even merit an ‘A’ grade. We already know that Smallville didn't know what to do with Kara last season and so banished her to the Phantom Zone. Then we found out that they would bring her back in the episode 'Bloodlines' airing November 6th. Now, I guess, we find out that the Phantom Zone is not a torturous wraith-like existence. Instead, at least from these pics from the Bloodline episode on Kryptonsite ( http://www.kryptonsite.com/bloodlinegallery1.htm ), the Zone looks sort of like Tatooine. Uh .... yeah .... that doesn't make much sense. Let me guess, she doesn't remember who she is. Makes it that much easier for Clark to leave her abandoned there. 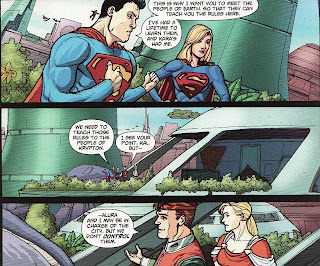 Or maybe, as I am guessing, she lets Clark leave the Zone while she stays there because he is 'destined for greatness'. I do not expect this to be good. But what else is new? The Superman: New Krypton Special was released last week and did a great job of kicking off this cross-over event, showing all the players and problems that have suddenly arisen with the restoration of Kandor on Earth. The issue was co-written by the super-titles authors Geoff Johns, James Robinson, and Sterling Gates. Art was provided by Gary Frank, Renato Guedes, and Pete Woods. I would be remiss if I didn’t include a shot of Renato Guedes’ variant cover. This cover reminds me of old fashioned movie posters where a variety of characters are all showcased. 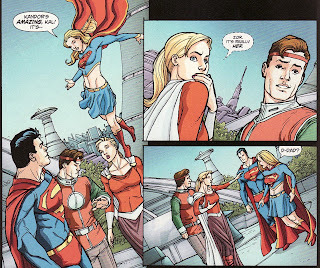 As I have said before, I really like Guedes’ take on Supergirl. The variant cost $4.99 at my local comic book store, only a buck more than cover. So it might be worth picking up. Of course, the big story here revolves around the sudden appearance of 100,000 Kryptonians on Earth and how that will impact the planet. But there was an underlying theme of upbringing and culture specifically for Superman. While Superman may be biologically Kryptonian, he is an American, a Terran. This was emphasized in the last Action Comics when Brainiac derisively calls him Earthman as opposed to Kryptonian. So how will a sudden influx of Krypton affect Clark … especially now that his father has died? The book solemnly opens with Pa’s funeral. 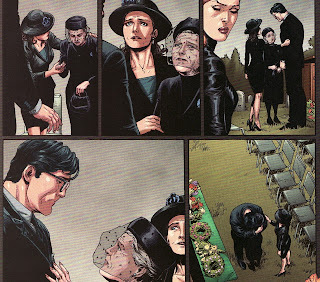 The first few pages have no words at all, instead silently showing Clark’s eulogy, people consoling Clark, him hugging Ma Kent, etc. It takes a powerful artist to pull these scenes off … someone who can evoke as much emotion and understanding of people’s thoughts without spelling them out. Gary Frank does great here. The forlorn funeral scene suddenly switches gears as we get into Clark’s head where he is thinking of bludgeoning Brainiac to death. 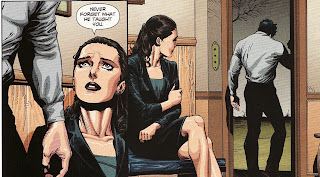 Lois comforts Clark who simply can’t get past the fact that Brainiac lives while Pa has died. Lois reminds him that he must honor Pa’s memory by never forgetting all Pa taught him. Those Kansas values are not Kryptonian values as we learn later on. While Clark mourns, we are shown where Brainiac has ended up. 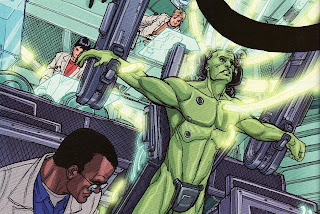 While Superman has Brainiac’s ship in the Fortress, the military has scooped up Brainiac’s body and attempt to hack into it with some slighty disastrous results. It is clear, as we have seen from the Atlas storyline in Superman, that there is at least a subset of the military that views Superman as a threat. That threat has obviously dramatically increased with Kandor. Ma gives Clark a heart to heart. She tells him that he needs to go to Kandor and that she will be fine. She tells him he knows what he needs to do and so Superman flies off to the arctic. And so we finally see Kandor, and I have to say that these were the best scenes in the book for me. There is no doubt that Superman is going to have his hands full here. Here Superman meets Zor-El and Alura. They tell him he has grown up to be a fine young man. When he says it is because of his father, they retort ‘yes … Jor-El’s tapes’. They just don’t seem to understand that Supes considers himself a citizen of Earth. But even here you get that sense that Superman is flummoxed about this internal cultural struggle. He doesn’t immediately say ‘no, I meant Pa Kent’. He just stammers and remains silent. Throughout this conversation we get the sense that the Kandorians, represented by multiple Kryptonian sects (including some troops of Zod) are already feeling some superiority. They don’t seem interested in learning about Terran cultures wondering why they would want to learn to be ‘less Kryptonian’, that Earth people have the ‘potential’ to be good. I worry about Alura’s motives more than Zor-El’s for some reason. She is the one who is already calling Earth by the name New Krypton. 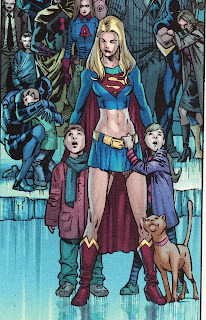 Finally we see Supergirl in the issue as she is re-united with her parents. For her it feels like about a year since she has seen them. Who knows how long it feels to her parents, as we have learned that time passed differently in the Brainiac bottle (thus explaining her parents youth despite Krypton’s destruction over 3 decades earlier). But instead of being a teary-eyed joyous reunion, it felt sort of cold. Did anyone else find this panel to be somewhat chilling? What does it mean ‘it’s really her’? And why such an understated response from both Zor-El and Alura? Now maybe I am reading waayyyy too deep into this, but they don’t seem surprised to see her, don’t act like people who haven’t seen their daughter for a long time. And so here comes my guess ... it is because they have seen their daughter recently, or a least a facsimile. Given Krypton’s history with cloning, my guess is Kara’s parents cloned her! Thus when they say it is ‘really her’ it is opposed to the ‘fake her clone’. And that clone turns out to be Superwoman! So, I am officially rescinding my ‘Lelsa Lar’ guess for Superwoman and instead going with ‘Kara clone’. It has some beats with the Galatea storyline from the JLU cartoon and makes some internal sense with Kryptonian culture. Of course, with Power Girl out there, it means there would be 3 Kara Zor-Els on Earth. Superman’s concerns for the impact the Kandorians will have on Earth become manifest all too soon. They all begin to develop powers and one kills a blue whale. When Superman says that was wrong, Zor-El seems to shrug and say they will try to teach the Kandorians what is right and wrong. But then the political clime of the city is discussed. 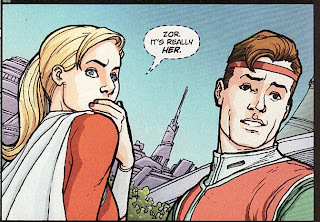 Zor-El states that since the last Kryptonian government failed by not listening to Jor-El’s warnings, New Krypton will have very little government. 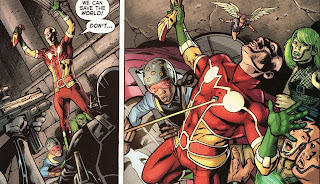 Zor-El is in charge of the city, but he does not control the people. It looks like Crowley was right ‘Do as thou wilt shall be the whole of the law’. While Supergirl feels comfortable that her father will keep everything right, Kal looks out as the Kandorians all fly off to the corners of the Earth. This doesn’t look good for the average man. Of course, the military has already been planning against Superman. We find out they have a cache of Kryptonite and magic-based weapons. And the general from earlier is revealed to be none other than the presumed dead Sam Lane, Lois’ dad. And if you want Kryptonians dead there is one person to go to. 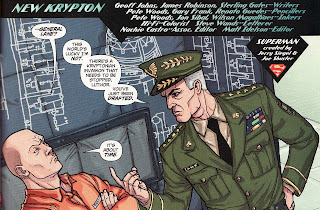 General Lane drafts Lex Luthor! This special did just what it was supposed to do: introduce all the major players and themes for the upcoming storyline so that the individual titles can hit the ground running. We know that there will be physical confrontations between the Kryptonians and Superman and the military. But I have to say, the more personal and emotional sidebars are what intrigue me the most. How does Superman separate his Earth loyalties and his Kryptonian loyalties? And Supergirl has the same issues. How does she decide Earth or Kandor? What exactly is up with her parents? And what about her various origins, which we know are going to be explained? There is so much potential for great stories here! I have said it before and I will say it again … it is a very good time to be a Supergirl fan. 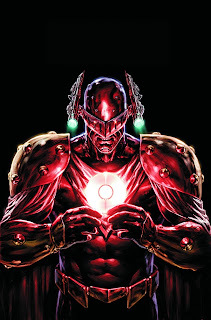 It has been a long two months for fans to wait, but Final Crisis #4 finally was released to this week. This was the first issue in which JG Jones did not provide complete art, with Carlos Pacheco stepping in to help. One good thing I need to emphasize is that Pacheco's art seemed to flow seamlessly with Jones' work, as a result there was no jarring discontinuity in styles to disrupt the story. There is very little Supergirl in this issue so feel free to scroll down about halfway to see her one panel. This was the issue in which "evil has won". Unfortunately, not much happens to progress the story line and as a result that was pretty disappointed. We find out early on that Darkseid was able to take over the Earth by broadcasting the anti-life equation on all electronic media be it radio, television, e-mail, the Internet ... you name it. Anyone caught listening was taken over. 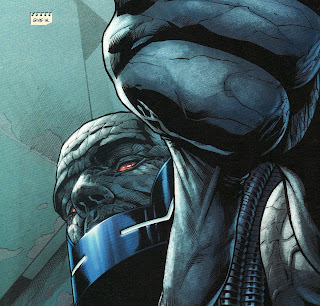 This Earth seems to mimic the Darkseid controlled one from Grant Morrison's 'Rock of Ages' JLA run, with people enslaved and put to work in factories. Super-powered Justifiers roam the land to keep control. We also learn that several pockets of super-heroes are holed up in Watchtowers across the Earth. One is in the Hall of Justice. This team includes Oracle, Green Arrow, Black Canary, and the extended Flash family. 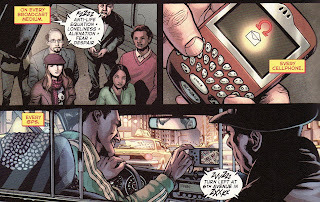 Another is in Switzerland, manned by Hawkman, Hawkgirl, Mister Terrific, and others. Another tower is in Africa; yet another in China. These heroes are constantly defending themselves against attacks but seem to be mobilizing for some final all out attack at Bludhaven ... an attack called The Omega Offensive. 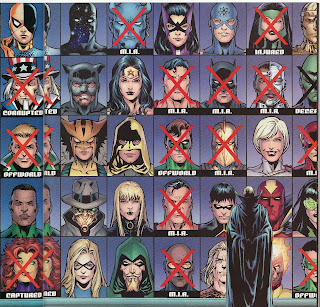 I did find that this panel from the Switzerland Watchtower interesting, in which Earth heroes are quantified and marked as alive, missing, or corrupted. How intriguing that Uncle Sam (upper left) is corrupted ...perhaps a political comment? 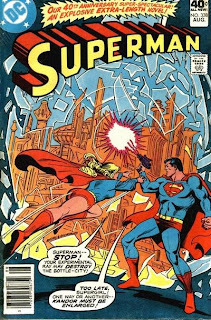 As for Supergirl, she leads one of the Watchtowers at the Fortress of Solitude. I am pleased that Grant Morrison felt Supergirl was strong enough to resist the Anti-Life equation. When you and look at the components of that equation (loneliness, mockery, fear, despair, self-worth, condemnation, etc) and look at the way Kara had been written early on in her own title, you would think she would be the first to fall. 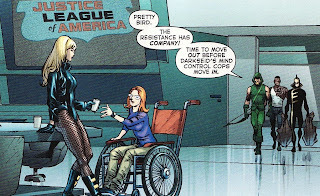 While the heroes prepare for the attack, Black Canary's group gets overrun by Justifiers. Green Arrow sacrifices himself to get the rest of the group into transporters to the JLA satellite where they begin priming weapons. Of note, Metron seems to have manifested in the Tattooed Man, a villain who has reluctantly joined the heroes. In the mean time, the 2 Flashes (Wally and Barry) share a moment in the bedlam around them, escaping Wonder Woman's Justifier squad. Later, there is a nice scene where Barry kisses Iris and releases her from the Anti-Life. Mister Miracle, who had been gathering a new Forever People earlier in the series, returns with the promise of the victory over Darkseid's forces only to be gunned down. As for the villains, they rejoice as Dan Turpin's will finally succumbs and he becomes the latest manifestation of Darkseid on Earth. The truth is that while there were 22 pages of action, this issue did not inspire the same confidence in the title I had last issue. I still can't wrap my head around Darkseid's 'falling downward through the universe' and causing all this mayhem. But even if I can get past that ... exactly what do we know after this issue that we did not know last month with the final shot of the transmogrified Wonder Woman. Not much. It is as though the plot moved forward a couple of baby steps rather than the giant steps I was hoping for. Yes, in this issue we saw that evil had won. But we knew that. And we saw that some heroes are hiding awaiting the right time to mobilize. But we don't see a plan here, only hear about one vaguely. There is no sense that the heroes understand what is going on any more than I do. And there is a palpable absence of the 'big characters'. I know that Superman is off in the beyond, Batman is captured, and Womder Woman is evil. And I understand how that adds to the peril the heroes are in. But can we have a super-mega-event where the main characters are Black Canary and Green Arrow? While their scenes here were touching, they don't carry the same weight. And even when we see semi-big characters (Flash, Alan Scott GL, Captain Marvel, Black Adam) we see them fleetingly. There is a lot of going on in this issue no doubt ... but I don't get the sense of a skeleton of a story for this stuff to stick to. And there are no main characters I can identify with or latch on to. Contrast that to Morrison's Doom Patrol. There was a lot going on in those issues too. But I always knew that there would be Cliff, Rebis, and Jane there as anchors for me as a reader. I may be contradicting myself, because I praised last issue for not spelling it all out for me. But the truth is we are half way through the story and I am still pretty perplexed. And frankly, I want to care about what happens and where this is going. But between the delays and the cryptic plot, I was a bit underwhelmed. Are those glowing eyed kids from issue one part of the plot anymore? Where is Libra? And we still need to take this story away from being simply a battle for Earth and make it a battle for the universe. We still need to see how the Monitors all fit in. We still need to have the Dark Monitor arrive. I still hope to understand how it all ties together, something I couldn't say about Morrison's Seven Soldiers, for example. I have shut Pandora's box and I am holding on to hope that this title turns itself around and becomes the masterpiece I want it to be. But this issue just didn't do it for me. There are a number of interesting items that month including the 'Faces of Evil' theme of villainous covers. January is the first month post-'New Krypton' for the super-titles. Supergirl is not mentioned as appearing in Action Comics or Superman, but with the integration of the titles it is hard to know if she will pop up there. And ... of course ... the Final Crisis finally wraps up with Superman Beyond #2 and Final Crisis #7. As mentioned everywhere else, JG Jones is not doing the pencilling on FC#7, handing the art over to Doug Mahnke. I know this is a Supergirl blog, but I have to say that I am pretty sick and tired of delays in comics and creators not being able to make deadlines. Growing up, this never seemed to be a problem. As a writer or artist, you had a deadline to make or (I assume) you were shown the door. Comics were always on time. I think of Crisis on Infinite Earths as a recent example of timeliness. 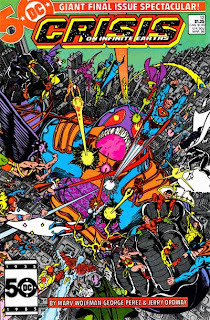 George Perez did every panel, had a million inset panels, drew most characters from the DCU in intricate and detailed pages, did the covers, and had the book out on time. Then I think of Infinite Crisis where there were multiple artists on one issue with each page being a different style. It is disconcerting. There are arguments that it would be better to give the creative team as much time as they need to assure a better artistic product. But this was a comic planned a year before issue 1 was released and Jones couldn't finish 7 issues? Is this because some comic creators are now 'rock stars' in the field, a 'big name' given some leeway the average creator doesn't get? Is this how DC wanted their summer block-buster to come off? Delayed and with a different artist? How much are we readers held to blame for tolerating this? Okay, enough ranting. I'm sorry. Here are the January solicits with some comments. “Who is Superwoman?” part 1 of 5 and a “Faces of Evil” issue! After her encounter with the mysterious Superwoman, Supergirl is left with two burning questions: who is Superwoman, and what gives her the right to wear the symbol of the House of El? The answers lead Supergirl into the darkest depths of New Krypton and drastically alter the Superman Family forever! Hmmm. The plot thickens a bit about Superwoman and her identity. It is interesting that she sticks around after 'New Krypton'. Makes me wonder if she is a Kryptonian after all. It does make the Linda Danvers guess a bit more likely. And "Who is Superwoman?" is a 5 parter. After #34 as a jumping on point and the 'New Krypton' cross-over event, it will be nice to see the new team settle into a long arc. I still hope it is Lesla Lar, but now I really doubt I am right. Super strength, the ability to fly and extra-speedy reflexes should make a girl’s life easier, but they only seem to complicate things for Supergirl. Life gets a lot crazier, though, when a new enemy named Belinda Zee shows up. And with girls like Belinda around, facing down Super-Villains doesn’t seem so bad. I like how on the cover, Supergirl seems more afraid of the girl (I presume Belinda Zee) than the chunk of Kryptonite in front of her. I think this comic is going to be great. The description sounds like it will show that adolescent confrontations can be as threatening as super-villains ... sort of a 'Mean Girls' for the super-sect. The super-girls at home are as excited as I am to read this title. 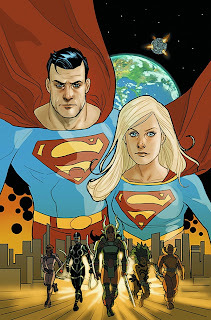 This explosive conclusion pits Superman and Supergirl against the combined might of Maelstrom and the Female Furies in the heart of Metropolis. Has Supergirl learned anything from her time on the alien world, or will she repeat her rookie mistakes? And what will be the fate of Maelstrom? I have gushed about Phil Noto in the past. This cover is gush-worthy. I *love* his rendition of Supergirl. I don't know if I necessarily consider Kara a rookie any more. 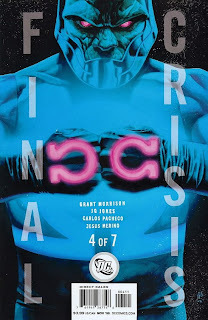 Sure she is still learning and trying and hopefully Palmiotti/Gray will have her grow in this mini-series so she does not 'repeat her rookie mistakes'. More than anything else, I am hoping that this mini-series shows Supergirl in a positive light. There are things about it that sound so promising: focusing on her relationship with Superman, the inclusion of Fourth World characters, and taking the super-cousins to new locations. I just fear that Supergirl will be portrayed as a mistake-prone rookie throughout. And now, the Kara-free issues worth mentioning. The war hits its horrifying crescendo, and Zatanna, Dr. Fate and the rest of the DCU’s magical characters must pick their sides as the new powers in Hell emerge! Plus, Dr. Occult learns Hell’s nastiest little secret, with grave consequences for the nature of life itself. But will he share it? Better yet, should he? So I keep mentioning this title because Linda Danvers is supposed to be appear here. But so far we have only seen her in a couple of pages of issue one. And I wasn't exactly thrilled with the way she was portrayed there. Hopefully we will see her again. Hopefully she will have some sort of meaningful role since she was the only reason I picked up this title. It’s an all-new prelude to the upcoming, all-new JUSTICE LEAGUE #1! Prometheus once defeated the Justice League single-handedly, and with his latest lethal crime spree, he's moved to the top of the heroes' Most Wanted list. But what grave crimes has he committed, and what will he do to prevent capture? Learn the real face of evil that is Prometheus! Well there are a couple of reasons to mention this stand-alone issue. One, I am a huge fan of Prometheus ... well, I am a huge fan of Prometheus when he appeared in Grant Morrison's JLA. In that book, he nearly took out the Justice League single-handedly. Of course, since then, he has been used more like a measuring stick for heroes to show how tough the hero is. I mean Huntress defeated him in Birds of Prey. I love the Huntress .... but defeating Prometheus? Anyways, the issue is written by Supergirl scribe Sterling Gates and he has said in interviews that Prometheus will be twisted and unstoppable here. I like the sound of that, sort of a return to his roots. And it is a prelude to James Robinson's Justice League! Some of you may have forgotten that this title is coming out! It was announced several month's ago but no release date has been released. 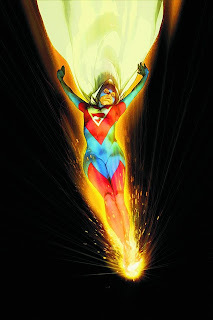 Of course, Supergirl is a member of this incarnation of the league as seen in this preview picture by title artist Mauro Cascioli. His art is stunning! His Supergirl is simply statuesque! So, January will be a busy month for the DCU and an important month for Kara. See you all then. Supergirl #37 cover - who is Superwoman? Review: Supergirl #34 - The Wait Is Over!